Google has rolled its 'offline Google Calendar' out to the public – after a more limited trial proved successful. Making its application available offline has been a key movement from Google this year, most notably with its popular Gmail service. 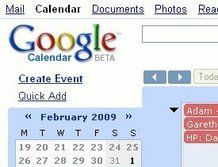 The Google Calendar was an obvious candidate for offline functionality, and after a trial for businesses and schools, it has now hit the public domain. Users will need to have Google Gears in order to get the offline calendar to work, and it will then allow them access to their Google Calendar even when their internet access is limited or unavailable. "In addition to offline access to Gmail while you're traveling or without a strong internet connection, you can now see your Google Calendar events when you're disconnected," says the official Gmail blog. "Offline Calendar lets you view your existing schedule and events, but not edit them, so you don't have to print out calendars the night before a trip."